3D printers are becoming more and more common. Just a couple years ago, they were really cutting-edge technology. Now you can get yourself a modestly-priced one to sit on your office desk at home. And they're getting to be more common all the time. Well, with that innovation in a lot of people's hands comes people looking to fill in the market for those owners with interesting products for their 3D printers. 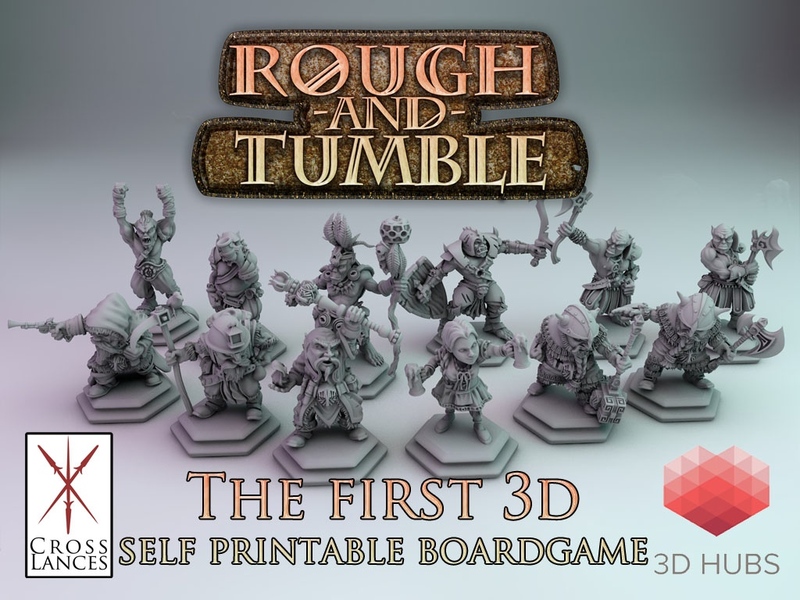 One is Rough and Tumble, a new Chess-like board game that's up on Kickstarter now. It takes "print and play" to a whole new dimension (yes, I'm proud of that one). As I mentioned above, the game is somewhat Chess-like, but with a lot of additions. First off, the game is on a hex-grid. Then, each faction has different abilities for their pieces. So think if the black pieces had different abilities than the white ones and you start to get an idea. Plus, if one set was dwarves and the other was orcs. There's that, too. Anyway, the campaign is running now. They're about 1/4 of the way to funded with still 27 days on the clock.